Ball players often leave school early to pursue their professional sports dreams. Many of them promise to return to campus to complete their degree. Friday, Pittsburgh Steelers safety Troy Polamalu kept that promise and graduated from the University of Southern California with a history degree. 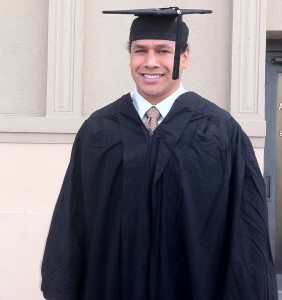 Even on such an important day in his life, Polamalu chooses to reward the academic excellence of others. He took to Twitter (@tpolamalu) to call for submissions for the Troy Polamalu Student of the Year Award. In a letter posted on his website, Troy had this to say…. So, I’d like to give back in a small way by recognizing a few truly outstanding students out there by sending them a signed jersey, but I need you to tell me who they are. Nominate a student of yours for a Student of the Year Award coming from me. Read the entire letter and gather details about the Troy Polamalu Student of the Year Award HERE. Playbook note: How did Troy get all that hair under that cap?